Marilyn SanClemente July 2, 2014 June 30, 2014 Baby cards, Stamper's Club, Stampin' Up! 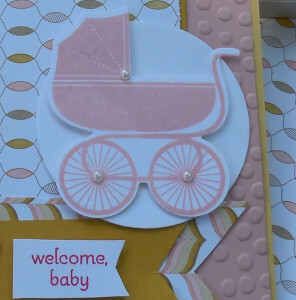 Today’s card is a handmade Baby Card that I made with the new Stampin’ Up! stamp set with matching framelits call Something f or Baby. I used the Lullaby Designer Paper for this card. 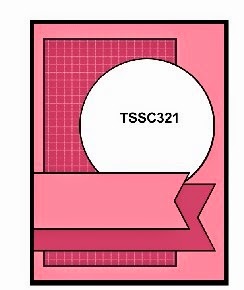 So the details for this card: Cardstocks: So Saffron for the card base. the layer is Blushing Bride that has been embossed with the Decorative Dot embossing folder. This is becoming my new favorite embossing folder since it is very whimsical. The designer paper is layered on Hello Honey card stock. The top narrower banner is also Hello Honey card stock. The buggy is stamped with Blushing Bride ink and cut out with the matching framelits. Last but not least, I embellished the buggy with small pearl jewels. This card was inspired by Mary Jo’s Technostamper challenge for this week. Like my card designs? This is one of the stamp sets that the Stamping New England design team will be featuring in August. Join my Stamper’s Club and for an investment of $35 per month for 6 months, you will receive the directions for 4-5 cards each month for FREE! Also – if there is a specific technique that we are covering then there will also be a technique video included in the Stamper’s Club file. You can check out the details here. Happy Stamping! What a wonderful card, all the patterns and textures work together so well. Love the little pearls on the buggy. Super cute, thanks so much for playing along with my sketch challenge this week!